Rayya is a Redguard warrior found in the Jarl's Longhouse in Falkreath. She becomes your personal housecarl when you have earned the title of Thane in Falkreath Hold. She wears a set of steel armor and an Alik'r hood. She dual-wields two scimitars. 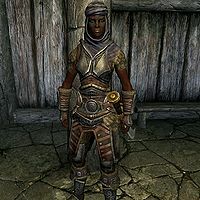 Rayya is one of the few followers in Skyrim who will dual wield as long as shields and two-handed weapons are not in her inventory. Like all followers who are capable of dual wielding, Rayya must be in actual combat before she will unsheathe the second weapon but will only unsheathe one weapon while out of combat. Rayya is the only non-Nord housecarl given to you. Rayya's two starting scimitars are listed twice in the inventory menu, but each listing is "stacked", showing "Scimitar (2)". When you remove one, a "stack" of two is removed; the same applies to the second "stack". This bug is fixed by version 3.0.6 of the Unofficial Skyrim Legendary Edition Patch. When you remove one scimitar from Rayya's inventory, she unequips both even though one still remains in her inventory. Sometimes when you try to dismiss her, she will not return to her "home". She will not wait when in that state. This page was last modified on 12 September 2016, at 11:13.